Artistic impression of Saltford Station by Joe Ryan. © Saltford Environment Group 2011. 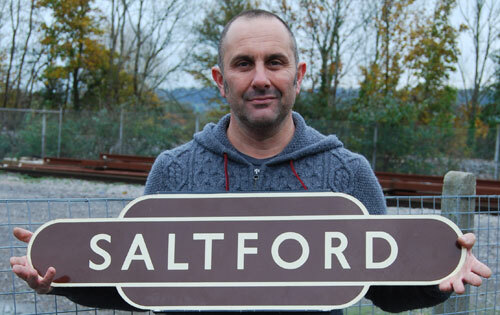 A reopened Saltford station will be of greatest benefit to Saltford's younger generation. Pictured here are Saltford Parish Councillors Cllr Duncan Hounsell, Cllr Adrian Betts, Cllr Phil Harding (also Chair of SEG), and Cllr Chris Warren (also Leader of SEG's Station Campaign) at the launch of the West of England's Joint Local Transport Plan (JTLP) 4th consultation at Somerdale Pavilion on Monday 11th February. During the morning's consultation event they pushed the case for re-opening Saltford Station on the existing site as part of the JLTP. The draft plan and consultation questionnaire can be found at www.travelwest.info/JLTP. The consultation closes on 20th March. We reported in November (2018) that Saltford Parish Council had sent a public letter (that can be downloaded here as a pdf) to a wide range of recipients including B&NES Council Leaders, our MP, First Great Western, Network Rail, West of England Combined Authority (WECA), and the local media expressing its frustration at the lack of information and misinformation from B&NES Council and WECA concerning the future re-opening of Saltford Station. A response to SPC's letter was received from Cllr Tim Bowles, West of England Mayor, in January 2019. Cllr Bowles stated that following his and Cllr Tim Warren's (Leader of B&NES Council) discussions, their intervention had ensured that a new railway station at Saltford will feature in a map of transport improvements in the Joint Local Transport Plan. The Joint Local Transport Plan will be open for public consultation in January 2019. To read Saltford Parish Council's comprehensive response of 29.1.2019 to Cllr Tim Bowles's letter, which has been copied to over 20 relevant people and organisations, download it here (pdf). The reply includes how SPC will respond to the Joint Local Transport Plan (referred to as JLTP4 in the letter) as well as the actions and information requested by SPC following the close of the consultation. Parish Councillors will discuss further actions to achieve the re-opening of Saltford Railway Station at the next SPC meeting on 5th February. On 19th November Saltford Parish Council sent a public letter to a wide range of recipients including B&NES Council Leaders, our MP, First Great Western, Network Rail, West of England Combined Authority (WECA), and the local media expressing its frustration at the lack of information and misinformation from B&NES Council and WECA concerning the future re-opening of Saltford Station. This lack of progress is despite the excellent business case in the 2014 'Saltford Station: Feasibility Study' prepared by CH2MHill. The letter can be downloaded here: SPC station letter 19.11.2018 (pdf, opens in new window). 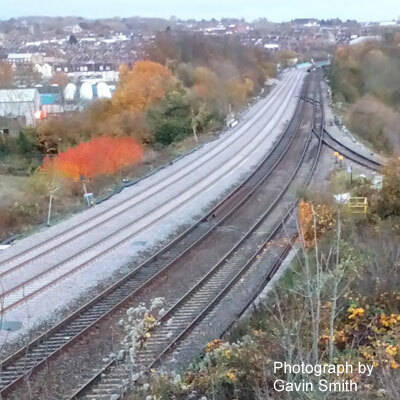 The business case for re-opening Saltford station depends on the success of the MetroWest rail project which is planned to bring half-hourly train services criss-crossing the Bristol-Bath sub-region. An essential piece of infrastructure to give capacity for MetroWest has now been put in place. This is the re-instatement of 4 tracks at Filton Bank between Bristol Temple Meads station and Bristol Parkway station (see photograph above). The additional track will allow local commuter trains to run alongside faster inter-city and cross-country services. Saltford station campaign leader Chris Warren has today (10th April) signed Railfuture's open letter to DfT that welcomes the Government's pledge to grow the railways, which featured prominently in the recent "Strategic Vision for Rail". The letter points out that many communities want to see a larger rail network and there is demand for new and reopened rail links across the country. It says that such investment can bring many benefits including better access to vital services and jobs, making new housing and other development more sustainable, and reduces pressure on the roads. But rail projects are difficult to deliver. Despite good will and a strong business case, many local authorities lack the skills and resources to take projects through a long and expensive development process. To ensure that the Government can deliver on its commitment to grow the railways the letter calls on the Government to establish at the earliest opportunity a 'network development fund'. Administered by the Department for Transport, the fund would pay for project development for new and reopened stations and lines which reach an agreed standard with the best projects joining a pool of national projects to be taken to full development and implementation. The letter etc. can be found from this link: www.railfuture.org.uk/article1781-Rail-reopening-fund. On 31st January 2018 the B&NES Cabinet Member for Transport, Cllr Mark Shelford, met with Station Campaign Leader Chris Warren and SEG Chairman Phil Harding at the Saltford Station site to see the site itself and discuss progress on re-opening the station. Cllr Mark Shelford said B&NES Council was fully in favour of re-opening railway stations like Saltford's where this is feasible but Network Rail had to confirm that space could be made for a half-hourly stop at Saltford in the rail timetable; such advice had not been provided. He agreed to write to Network Rail to ask if the rail timetable could accommodate a half-hourly stop and would do this as soon as the Station Campaign provides its documentary evidence received from Network Rail that provision at the site for a re-opened station had been made in its planning for the site. B&NES Council is to undertake a preliminary study looking at the feasibility and potential of introducing some form of light rail 'tram' system in Bath. The decision to carry out the study comes in response to suggestions from the public, made over the past year, for a review to take place looking at the possible use of trams or a light rail system in the city. Improving the area's transport network is one of the Council's top priorities, and whilst the introduction of a tram system does not currently form part of the Council's formally adopted Transport Strategy, the authority has said it keeps an open mind to suggestions to improve transport that could be taken forward in future. As a result, this short scoping study will look at the feasibility of using a light rail system as a sustainable form of transport in the city. The feasibility study will be completed within this financial year (2017/18). Some residents may be aware that from 1905 to 1938 there was a tram service at The Globe Inn, Newton St Loe, from Bath. In the first week when the service opened in 1905 9,000 passengers rode on the trams and the tram company planned to push even further west to Saltford. In 1906 Keynsham D.C. opposed the Bath Electric Tramway extension to Saltford so those plans were shelved. But the Newton St Loe route failed to prosper and the line was taken out in 1938 about a year after the Bath Electric Tramway was taken over by the Bristol Carriage Company. On 12th June the leader of SEG's Saltford Station campaign Chris Warren gave an interesting and well-received talk on the history of railways at Saltford. Chris's talk was part of the Saltford Festival (10-18 June) that includes lunchtime talks on a range of topics for each weekday of the festival. You can download the text of his talk here: The history of railways at Saltford by Chris Warren (pdf). For the 2015 General Election members will recall that SEG's station campaign, which takes a politically neutral stance, enjoyed support from the local Parliamentary candidates of all three main political parties for the objective to re-open the station on the existing site. We can report that this cross-party support has been repeated by the 2017 candidates for the 8th June General Election. 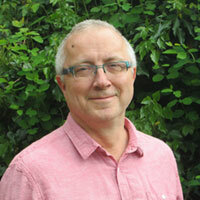 Robin Moss (pictured above), the Labour Party candidate for NE Somerset has told SEG of his support for re-opening the station on the current site: "A project to take cars off the A4 and so improve air quality in the village must be supported." 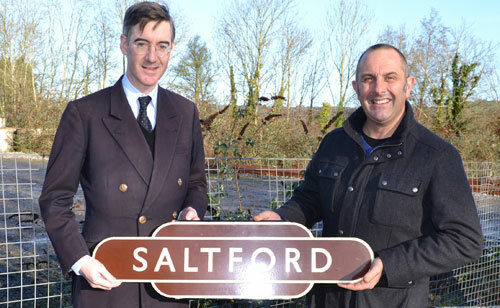 Our local Conservative MP Jacob Rees-Mogg (pictured above with Saltford Station campaign leader Chris Warren in 2015) has been a long term supporter for the re-opening of Saltford Station. 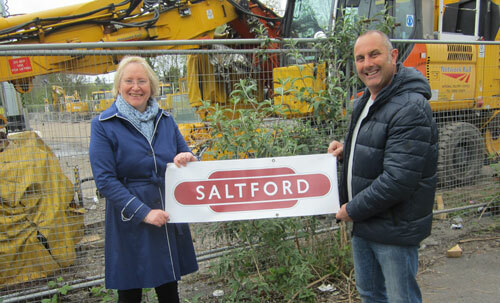 Showing her support for the re-opening of Saltford station is the Liberal Democrats' 2017 General Election candidate for NE Somerset, Manda Rigby, seen pictured here at the station site with Chris Warren. "Transforming our local rail network by re-opening stations and increasing local services." "Protecting more of our green fields by promoting urban regeneration sites instead to build more affordable homes." "backing major transport infrastructure, particularly the Avon Ring Road/M4 J18a and the A34/46 Link Road"
if implemented has the potential to divert traffic between Southampton/Portsmouth and Bristol/Avonmouth away from the A4 through Saltford. West of England Regional Mayoral Candidate Stephen Williams (Lib Dem, formerly MP for Bristol West and coalition government minister) visited Saltford on 6th March 2017 to discuss his backing for the reopening of railway station at Saltford as part of the MetroWest project. 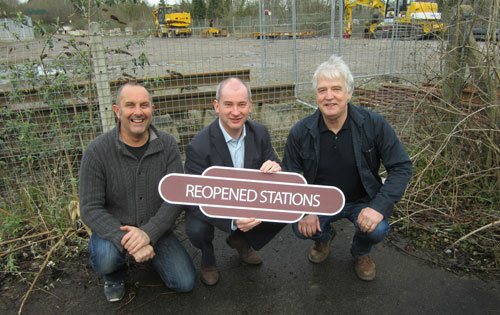 He is pictured here (centre) at Saltford station site with Chairman of Saltford Parish Council and station campaign leader Chris Warren (left) and Adrian Betts (right), Chairman of Saltford Parish Council's Planning Committee. After discussions and lobbying of B&NES Council the Saltford station campaign team learned on 1st December from B&NES Council's Divisional Director of Environmental Services that within the timetabling work for Metro West Phase 1 the potential for Saltford Station as an additional stop within this part of the GWR network is being tested. We shall report on this again when we hear further news. Q 12. I understand that the MetroWest Phase1 GRIP 3 Timetable Analysis remit specification only proposes a sensitivity test for "inclusion of call at the proposed Saltford Station". Was it an officer or a Cabinet member who made the decision to exclude Saltford Station at the outset from the substantial study? A.12.This was an officer decision taken at the MetroWest Phase 1 project board. I and the Leader have met with both GWR and the Saltford Parish Council to understand the technical challenges with this work. It is very frustrating that it is still not clear that a timetable is possible that would support a new station at Saltford. This difficulty has been discussed with the Parish Council on a number of occasions. A new station to serve the communities in and around Saltford is included within the Joint Transport Vision published by the West of England; this is something for which I have personally argued. Q 13. Has any Cabinet member contacted GWR and/or Network Rail directly seeking progress of the timetable analysis in relation to Saltford? A 13. As noted above I regularly meet with GWR and at the last six or so occasions I have specifically requested that time-tabling work should be undertaken. Officers have also requested the information. Four electrification projects planned as part of the Great Western upgrade programme have been deferred, Transport Minister Paul Maynard confirmed in a written statement to Parliament on 8 November 2016. This includes deferment of the Bath Spa to Bristol Temple Meads upgrade programme, i.e. the route through Saltford. Paul Maynard said he had decided to defer the projects because the benefits expected by passengers, including the introduction of new rolling stock providing more capacity, could be achieved without requiring costly and disruptive electrification work. He said this was expected to save between £146m and £165m in the current regulatory control period which runs to 31 March 2019. 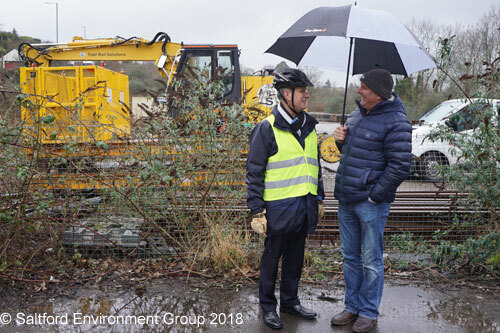 Jacob Rees-Mogg MP with Chris Warren at Saltford station site in January 2015. In an article in the 4th of August edition of local newspaper The Week In Saltford Station Campaign leader Chris Warren says he has been overwhelmed at the support from the majority of the community in Saltford to the campaign to reopen Saltford station but raises his concern that support has not been forthcoming in action, rather than words, from B&NES Council. Of particular concern is the omission of Saltford from the MetroWest timetable studies. The campaign will be stepping up its efforts to encourage B&NES Council to match the support given to re-opening the station by our local MP Jacob Rees-Mogg. Two representatives met with B&NES Council Leader Tim Warren on 10th August where an assurance was given that B&NES Council would pursue investigations for timetable space for a half-hourly stop at Saltford in the context of the new MetroWest service. The article can be found on page 20 of The Week In (issue no. 434, 4.8.2016) from this link: The Week In, Issue 434 (pdf on external site). "The Council has an aspiration to open an additional station at Saltford, which can potentially be achieved after Metro West Phase 1 has been implemented. However, it is dependent upon the Metro West Phase 1 project delivering a workable timetable that will improve services at Keynsham and Oldfield Park to a half-hourly frequency. Unfortunately, the above GWR timetable work for Phase 1 has been delayed by a couple of months. As soon as this work has been completed the Council can then continue to undertake further feasibility work on the Saltford Station proposal." On 27 January 2016 SEG submitted comments to West of England Joint Transport Study. The local councils of Bath & North East Somerset, Bristol, North Somerset and South Gloucestershire were seeking people's views on how and where transport should be provided over the next 20 years as part of the Joint Spatial Plan. Saltford Environment Group strongly supports the development of the Metro West rail project and re-opening a railway station at Saltford as part of Metro West. Saltford Environment Group recognises that transport congestion and a reduction in air quality is already a major problem at peak periods for existing settlements and communities. Saltford is a typical example as it has high levels of traffic congestion at peak times and part of the A4 through Saltford has been designated an Air Quality Management Area due to periodic and dangerously high levels of Nitrogen Dioxide from vehicles. For that reason, improved transport solutions should be developed to cope with existing problems quite apart from serving new housing developments all of which should be located close to public transport and main centres of employment to reduce commuting times and distances. To help encourage healthier lifestyles and less use of the car, especially for commuting, we recommend that the creation of more cycle paths and the joining together of existing cycle paths should be a priority for all local authorities in the West of England. More locally to Saltford, a cycle path along the Keynsham bypass (A4) should be a priority to enable cyclists to safely use that route into Brislington and Bristol whilst moving east towards Bath a cycle path from Saltford along the A4 to join the cycle path from the Globe Inn along the A4 dual carriageway would be a worthwhile project to implement. Saltford Parish Council reminds B&NES Council of its role since 2011 as the official promoter of the station and asks B&NES Council to make an effective and renewed commitment to engage with the West of England Local Transport Body, GWR and Network Rail to seek the re-opening of Saltford station and to make every effort to secure a place for Saltford station in the Metro West timetable. Saltford Parish Council notes that the public leaflet produced by the West of England Partnership Metro West - Investing in our local rail network (June 2014) stated that a Saltford Station could be in Metro West phase 1 subject to the business case. Saltford Parish Council therefore wishes to express its concern that B&NES Council did not seek to include Saltford Station in the current Metro West timetable studies being carried out by GWR on behalf of the West of England Local Transport Body. Saltford Parish Council wishes to express its dissatisfaction that reasons given for this include comments on time-table constraints which would have been better determined by Saltford actually having been included in these studies. Saltford Parish Council notes that while alternatives need to be considered as part of the Department for Transport's TAG (Transport Analysis Guidance) process and also to fulfil a past resolution of B&NES Council, there remains a consensus that the existing site is the preferred site option. The Saltford station campaign team's latest situation report (briefing paper) brings together the recent positive developments towards getting our station reopened. The report can be found on this page under Campaign Resources. At the Network Rail in Saltford on 15th December at St Mary's Church Hall information was shared with residents about the planned works at and near Saltford as Network Rail continues to prepare for the electrification of the main-line. Passengers will notice structural changes to the platform and canopies at Keynsham station beginning in January 2016. Keynsham station and the line itself will be closed from 2nd to the 10th of April 2016 whilst the track bed and platforms are lowered and foundations laid for the overhead electric pylons. Replacement buses will operate throughout this period. Fortunately, and thanks to Brunel, Saltford Tunnel underneath Tunnel House is high enough to accommodate the overhead cables and gantries without requiring additional engineering work. The Network Rail website with more information concerning this work is at www.networkrail.co.uk/great-western-route-modernisation/. ACKNOWLEDGEMENT: Our thanks go to Parish Council Chairman Cllr Duncan Hounsell for providing this information. Earlier news stories and pictures from the start of SEG's campaign can be found in our Campaign Archive. Please continue to display the poster in your window to help keep the campaign in everyone's mind. If you need a fresh one contact Chris Warren or Phil Harding (see contact details on home page) - or print one off from the resources section below. * Illustrated paper promoting and stating the environmental, social and economic case for reopening the station. You can download from here a one page poster to print off and stick in your window:- Saltford Station - Let's bring it back! poster (pdf, opens in a new window). Our unique Saltford station campaign mugs (£5) and car/window stickers (£1) are available from Signs of Saltford, 559 Bath Road, Saltford, Bristol BS31 3JN (Tel: 01225 874037). You can order these via the internet at: www.signsofsaltford.co.uk/station.htm or arrange to collect from Signs of Saltford during office hours (please telephone first, cash payment preferred). 39% of the respondents to the 2009 parish questionnaire, when road fuel prices were significantly lower, said they would be likely to make regular use of a rail service from a reopened Saltford station. Saltford station was closed in 1970 when significantly less people lived in Saltford. Early in 2011 the government announced it was going to electrify Brunel's Great Western Mainline from London Paddington through to Cardiff, i.e. a significant infrastructure project resulting in electric trains running through Bath, Keynsham and Saltford. Saltford Environment Group saw this as a 'once in a lifetime' opportunity for Saltford that was too good to miss. Electric trains mean faster acceleration and deceleration leading to quicker timings and gaps in the timetable for reopened stations. Electrification and the simultaneous re-signalling of the line can provide the capacity for local trains to stop at Saltford. Saltford Environment Group felt the time was right to start a campaign to get our station back. From our observations of public statements and our own discussions with key senior members of Bath and North East Somerset Council (the leader, Paul Crossley, and the cabinet member for transport, Roger Symonds) it was clear that they shared our view too. Railways are about the future of transport, not just the past. With the ever increasing cost of private motoring, a reopened station gives the residents of Saltford a vital and environmentally friendly transport asset that will help 'future proof' the village against future price rises in oil and thus road fuel. Many residents commute to Bath, Bristol, London and beyond. Saltford has quite a large student population who attend universities all over the country. Many people visit the village; a railway station will give people the option to visit without using the car. The Saltford Station Campaign team made representations to the West of England Partnership (WEP) Joint Transport Executive Committee concerning the inclusion of Saltford station in the Greater Bristol Metro project. The Greater Bristol Metro project successful bid to the Department of Transport in June 2012 included half hourly trains between Bristol and Bath and the reopening of Saltford station. We see the station as a real asset primarily for the local community, not a vast 'Park & Ride' arrangement although we recognise that a reasonable amount of car parking should be provided for the station to be economically viable. The design and facilities of the station will need to respect the character and environment of our village and be sensitive to the quality of life for those residents living nearby. Saltford's residents will be able to access the station on foot as there is a comprehensive network of footpaths that the Victorians put in place when the station was opened on 12th December 1840. At its busiest, Saltford station employed 12 porters. It would be great to have our station back serving the village community as it did once before. An important approach for SEG with this campaign has been to maintain a dialogue with Bath and North East Somerset Council and Network Rail as well as with local politicians (Saltford Parish Council and our local MP). Network Rail's publication "Investment in Stations - A guide for promoters and developers (May 2011)" is a framework that provides information on the principles and processes for those wishing to reopen stations on Britain's rail network and has helped guide our campaign. Involving the active support of residents in this campaign has been crucial. In addition to working with local media and the production of promotional materials (posters, stickers etc), we organised a village petition of all households in November 2011. The agreement by B&NES Council to be the station "promoter", to fund and engage experts to work with Network Rail and the rail operator to build the business case (a 'High Level Option Assessment') for reopening Saltford station, was a major milestone reached in June 2012, as was the inclusion of Saltford station in the Greater Bristol Metro project at that time. Our website provides a focal point informing all stakeholders of progress with the campaign to reopen the station. We publish our campaign news and plans on our website and regularly in the bi-monthly editions of SCAN (Saltford Commmunity Association News) that is delivered to all households. Concerned about the environmental impact of the station once it's built? SEG are very keen to stress that a new station built on the old station site must be sensitive to the quality of life for people living in the immediate vicinity. We are not proposing the replacement of the existing eye-sore - currently the old station site looks like a dumping ground and has attracted metal thieves who turn up in vans to remove metal items stored on site - with a station that looks out of place with our beautiful village. Our archive & photo gallery for the original station (link) shows what an important part the station has played in village life in the past and we wish to see a modern re-creation of this community asset. taking an active interest in the station's place as a positive asset for our village. Once our station is built, the Severnside Community Rail Partnership will actively support a Friends of Saltford Station Group. Image copyright information. There were six original 1948 Nationalisation era Saltford station signs or 'Totems' at the station site. This digital image of the Saltford station totem was created by and belongs to Saltford Environment Group. It should not be copied or used without the prior-permission of SEG's Station Campaign. If you wish to use it please send details of your proposed use with your request (our contact email address is on the home page). 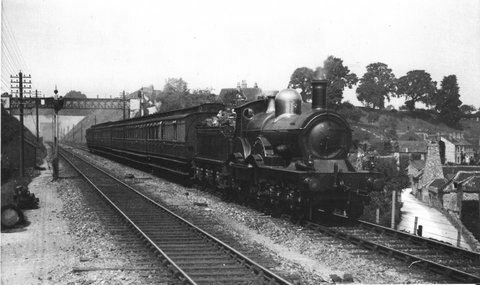 ...visitors had the option to arrive in Saltford by train? ...I could guarantee getting to work or other destination on time by train, instead of agonising about the traffic on the road? ...motoring and bus travel becomes much more expensive and we haven't got a local option to travel by train? ...free bus passes are withdrawn and we've missed the chance to get our station back? ...a train station meant you didn't need to run a second car? ...congestion on the A4 increases but we had missed this opportunity to get our station back for local commuters? ...the chance to create a safer crossing point on the Bath Hill was missed? 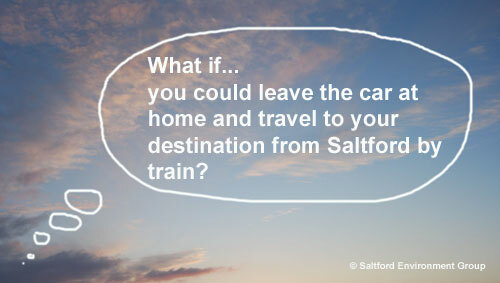 ...you could leave the car at home and travel to your destination from Saltford by train? ...an opportunity for more parking in the station car park for local residents was not taken? ...the station site was sold for a non-transport related purpose? "An extra 12 hours or more a week with my son. In addition, I currently spend in excess of £60 a week on parking. My journey is so often delayed due to road congestion that I am unreliable with my employer and my family commitments." "The train would substantially reduce my travelling time (approx 1hr 30 mins or more by bus) and would increase my quality of life! It would probably give me 2 hours a day that I could spend with my family!" "My journey can be dreadful after 8am making me late occasionally for important clinical duties. A station at Saltford would cut commuting time and get me walking more for a healthier life-style." "It would be heaven, much quicker, less costly, working day reduced by 2 hours, more sustainable and environmentally friendly. The whole family would use it." "I would run only one car rather than two. Life would be less stressful since I would not have to drive to and from work... I would be helping to reduce traffic congestion." "Very isolated in Saltford if you do not have a car or money. College / work / social life - only if you pay a fortune to First Bus!"